When growing up, in the winter, my mum would often make soup on a Saturday. One of the soups my mum made was Red Pea Soup – with Spinner Dumplings (Jamaican dumplings that would be rolled in to a sausage shape). The soup would be slowly cooked on a Saturday afternoon, with the smells wafting through the house making anyone who came over feel hungry. 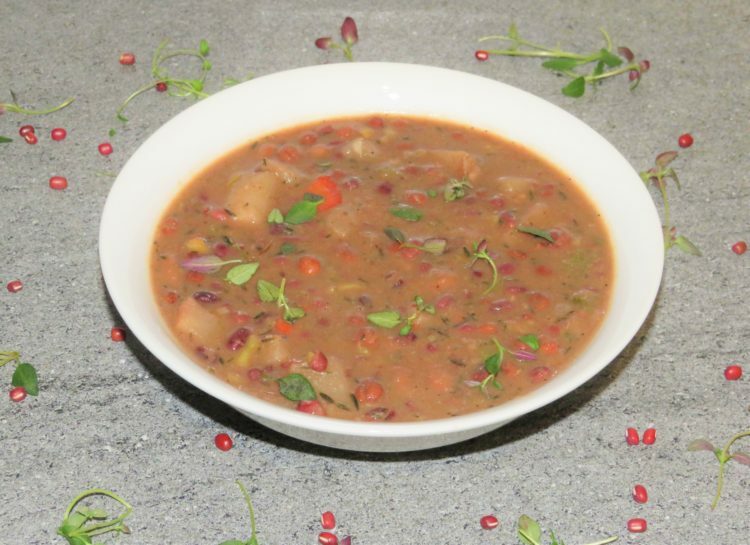 This recipe, my variation of the soup, is made with lots of West Indian vegetables. I didn’t make any spinner dumpling in the soup, if you wish you could make gluten free spinner dumplings and add them to the soup, but it is just as hearty and filling without them. 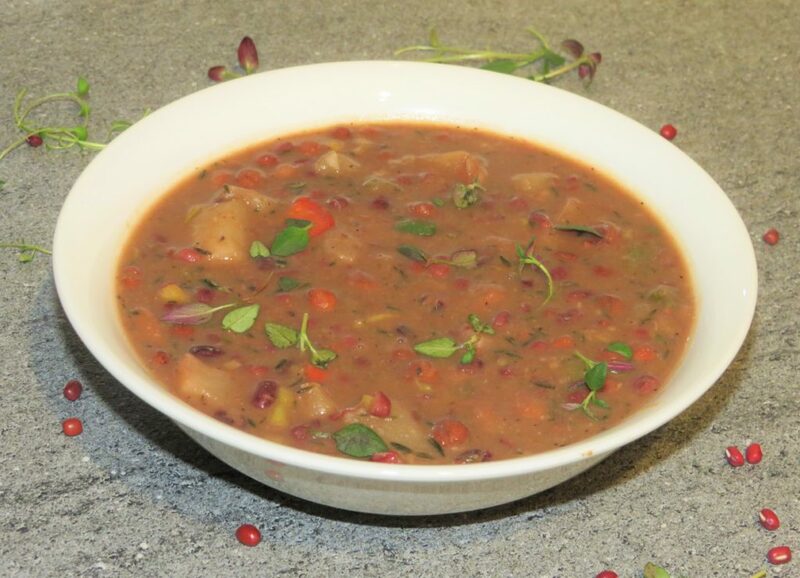 For the spinner dumpling recipe, click here to check out my pepper pot soup with spinner dumplings. 1 Put all of the ingredients to cook ‘the Adzuki Beans’ in a sauce pan. On a high heat bring to the boil, stir then turn down to a low heat and cook for 30- 40 minutes until al dente and then set aside. 2 Heat a large saucepan on a medium heat, when hot add the 1 tbsp of coconut oil. 3 When the coconut oil has melted add the onions, red pepper and green pepper, stir and leave to cook for 3 minutes. Then add the scotch bonnet pepper, garlic, allspice seasoning and black pepper stir and leave to cook for 5 minutes, stirring occasionally. 4 Then add the cho cho stir and leave to cook for another 5 minutes, occasionally stirring. 5 Then add the Jamaican sweet potatoes, the breadfruit, thyme and the water, stir and on a high heat bring to a boil and cook for 5 minutes. 6 After 5 minutes add the adzuki beans and the gungo peas, stir and bring back to the boil, then stir and leave to cook for 15 minutes stirring occasionally on a medium heat. 7 Then add the coconut flour and water mix, stir and leave to cook for another 10 minutes. 8 Remove the saucepan from the heat and leave to stand for 5-10 minutes with the lid half off. 9 Stir and you are ready to serve and enjoy the taste of the Caribbean. Cho cho (Chayote) is very low in calories and high in dietary fibre. It contains a high level of folates, B-complex vitamins, vitamin-C, iron, manganese, phosphorus, zinc and copper. Gungo peas (Pigeon peas) is an excellent source of calcium, iron, selenium, magnesium, protein, phosphorus, potassium and vitamin-C. They help maintain a healthy blood pressure and a healthy heart, aids weight loss, boost energy, aids immunity and are rich in dietary fibre. Adzuki beans (cow peas) has high levels of protein, copper, zinc magnesium, folic acid, potassium, folate, vitamin-B and dietary fibre. It aids weight loss, aids digestion and helps to detoxify the body, helps in growth and repair of cells in the body, boosts bone health and prevents osteoporosis, boosts brain function, helps to maintain a heathy heart and prevents and manage diabetes. Allspice (pimento) aids digestion, has anti-inflammatory, anti-flatulent and antiseptic properties. It is rich in vitamin-A, vitamin B-6 and vitamin-C has good amounts of potassium, manganese, iron, copper, selenium and magnesium.